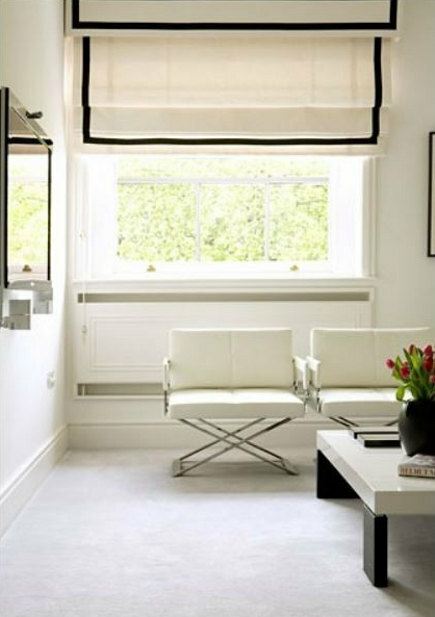 More tailored than draperies but more versatile than blinds, Roman shades can be mounted inside or outside any window. They come in a wide variety of styles and interpretations and workrooms and catalogs specializing in Romans present charts with various options. I’ll leave the subject of configurations and mounting styles for another post. Today, I’m focusing on the effect of decorative roman shade details I find especially appealing. I’m not against patterned fabric on Roman shades though I’m not especially for it because I find it distracting and too often not in a good way. 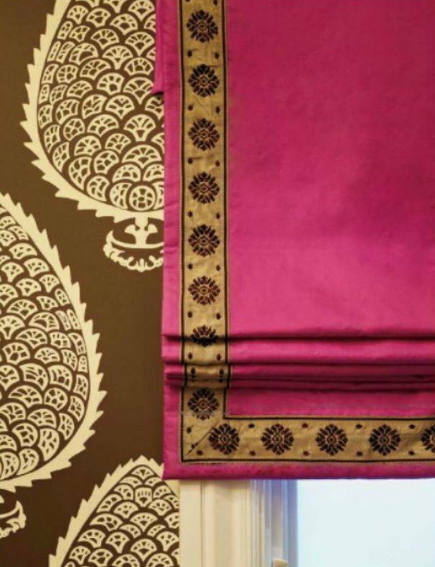 Besides, embellishments tend to look best on solids like the stunning pink Tiffany silk from Cowan & Tout that Palmer Weiss used in a San Francisco powder room [top]. To tie the shade into the brown Katie Ridder Leaf wallpaper, Weiss inset gold banding with brown rosettes, from Samuel & Sons, along the bottom and sides. The placement of the border is close enough to the edge to link it visually into the wallpaper but not to look competitive. A classic approach to a wider, embroidered border like Samuel & Sons Oxford, is to leave a more generous margin around the edges and bottom. Designer Lee Ann Thornton did just that for a seaside house in Connecticut. I’m not loving the messy mitered corner — the tape which could have been better matched by the workroom. Compare it to the mitered corner on the pink shade (above). 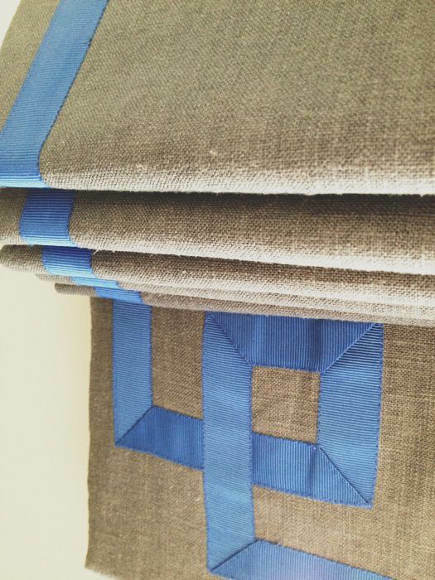 Grant K. Gibson does beautiful Romans. . “I love the texture of the grey linen and then the blue grosgrain trim detailing. My seamstress sure had her work cut out for her with this commission,” he wrote in the caption on his blog. Indeed she did. It’s not easy to produce the fret detail on the corner of this blind but it is gorgeous and impeccably rendered. 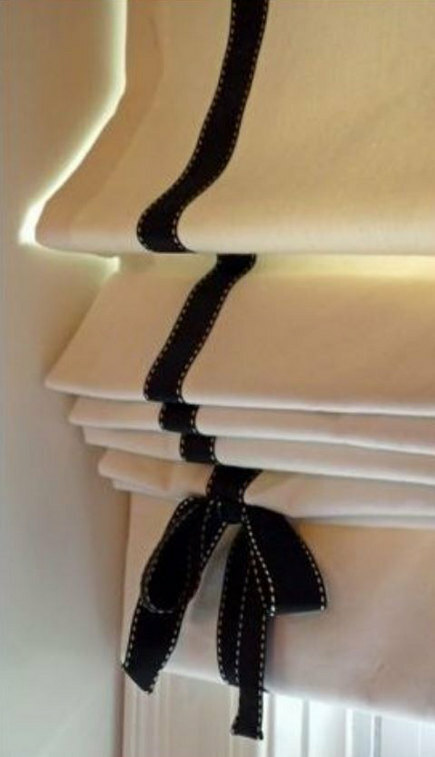 Black ribbon, contrast stitched in white, makes a simple and dramatic embellishment for an off-white shade. Placement of the bow detail is critical so that, when the shade is lifted, the bow becomes artful, humorous and girly. This shade was a special favorite on Pinterest, with good reason. When we renovated our cottage in the woods, we removed a wall between the front and back parlors and added a 72-inch long south-facing picture window. 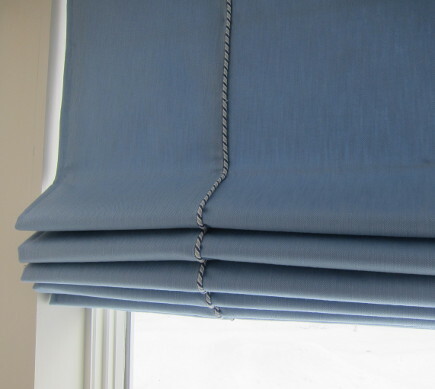 I designed a simple Roman in Wakefield Sky denim to coordinate with a pair of curtains on the adjacent wall. Because the shade was too wide to be made without seams, I found a variegated lip cording at Kravet to disguise them. 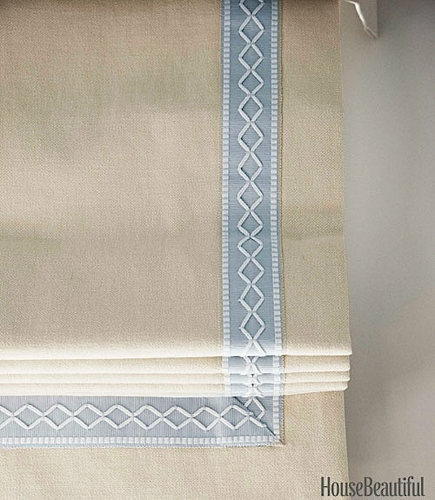 This Roman shade detail is the result of a lively DIY tutorial on the Little Green Notebook blog. 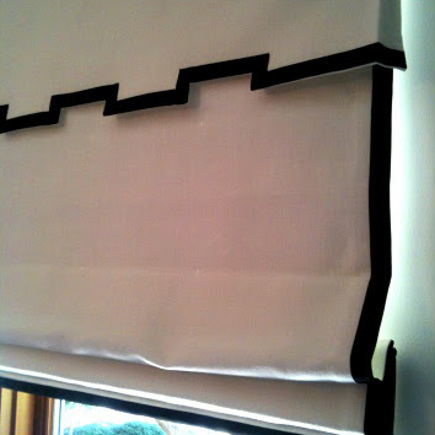 Marc Jacobs linen and vintage geometric trim were added to modify mini blinds. The border is actually glued on the edges – not ideal for the long term, but effective. 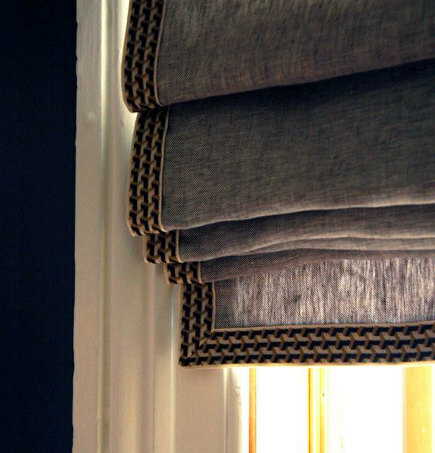 The blind was designed to tie into dark bedroom walls painted with Benjamin Moore’s Anchor Gray. London-style linen shades have a curved blouson bottoms that gather slightly when retracted. That allows the pretty woven raffia trim to show along the bottom. The very top of these guestroom shades is also banded which provides a neat finish similar to molding because they are installed at ceiling height. A sweet pink ruffle at the bottom of a pair of London shades in a baby’s room adds an unusual and whimsical touch that keeps things from being too serious. 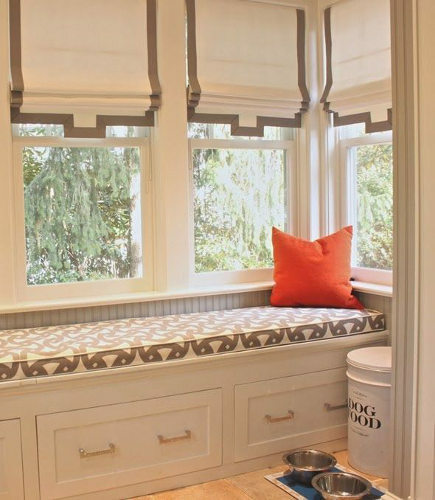 The window seat in a mudroom is perfectly coordinated with shades done in the same taupe and white scheme as the print on the cushion. Bottom edges of the blinds have a center apron detail that mimics the drawer hardware in a wonderful way and likely conceals pull-down rings. 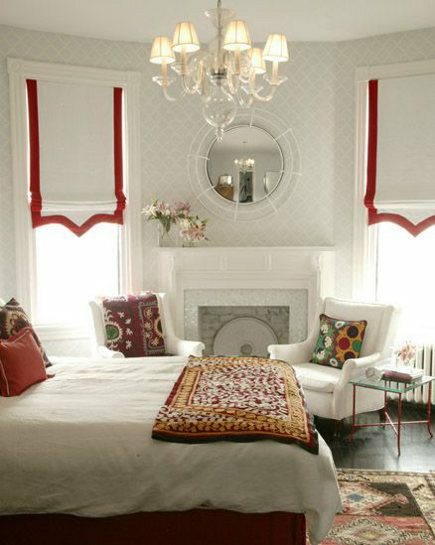 An apartment in Russia has red-banded Roman shades with pointed centers that evoke exotic Asian slippers and coordinate with the suzani bed cover and pillows. Another Grant K. Gibson shade, this one for a child’s room, ismade of a white canvas linen blend. Black grosgrain ribbon is sewn in place along the outside edge. But I think it’s the tent-edge valance that kicks it up several notches on the style meter. How different and modern this white shade with black trim looks. That’s because the black border is inset on both the shade and the valance. It’s a good example of what a difference the placement of a ribbon border can make. 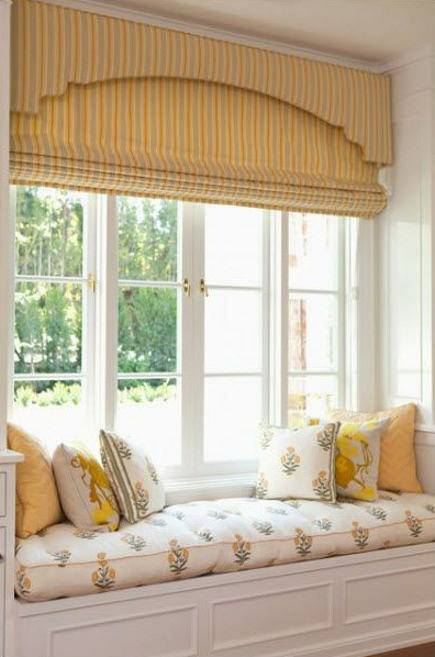 In a window seat niche, the awkward space between the top of the windows and the ceiling is covered by an scalloped upholstered cornice. And using a treatment usually applied to draperies, a plain Roman shade in matching fabric is tucked underneath. The result is charming and romantic. Great post with lots of beautiful examples. I own a custom drapery workroom and adore roman shades! 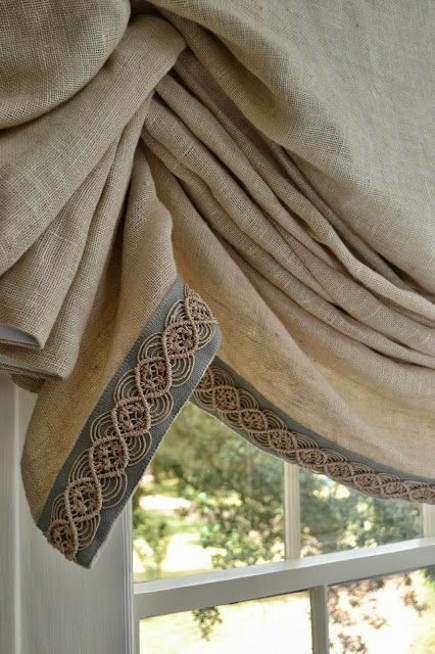 I would love to see a tutorial on how to attach a border to a roman shade. If you ever feel inclined to post one, it would be such a big help. I’m not a big fan of most window treatments, especially because we have beautiful woodwork detail that I don’t want to cover, and also, our windows have divided lights across the top. But I’ve been feeling the need for something for insulation on colder days, and I do love these tailored shades! This kind of shades really create a distinct and sumptuous look… Thanks for sharing! Perfect example of the black and white shades I want to hang in my dining room. Thank you!